Low Heights (Ertefae Past, alternate English title: Low Altitude, 2002), is an Iranian film directed by Ebrahim Hatamikia that takes on the daunting task of combining bald humor with the terror-filled anxiety of an airplane hijacking. Released shortly after the 911 terrorist hijacking in the US, the film recounts the story of an Iranian domestic flight from Abadan to Bandar-Abbas that is hijacked by one of the passengers, and most of the film takes place inside the cramped quarters of the plane in flight. The script by Hatamikia and Asghar Farhadi has some unusual aspects, even for the wide scope of the action-adventure genre. 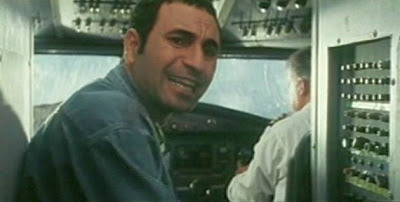 First of all, the focalization is not from the perspective of an innocent passenger caught up in unexpected circumstances, but from the point of view of the hijackers, Ghasem and Narges, played by Hamid Farokhnezhad, who would later star in Farhadi’s Fireworks Wednesday (2006), and Leila Hatami (Leila, 1996). Second, domestic and social issues are a significant subtheme of the story. In fact the determination of some people to get out of Iran was a theme continued in Farhadi’s later, A Separation (2011). The movie begins in the Abadan airport, where Narges is anxiously awaiting her husband, who is late for the scheduled takeoff. At first her anxiety appears to be due to her attempts to conceal her pregnant condition – evidently pregnant women are not allowed to fly. 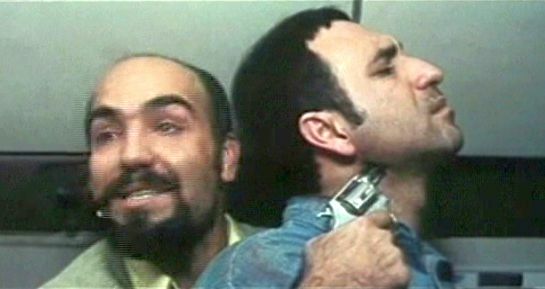 But after Ghasem arrives, it ultimately becomes clear that he intends to hijack the plane to a foreign destination (Iranians ordinarily need to get exit permission to leave the country, and apparently Ghasem cannot obtain this). In order to carry out this scheme, Ghasem had sold all his possessions and bought airplane tickets for his entire extended family, promising them all jobs that he had secured for them at the Total petroleum company in Bandar-Abas. Ghasem’s plan was to populate the plane, a two-engine propeller aircraft that can hold maybe fifty, with people from his own extended family, who would then be expected to support him in the event of chaos on the plane, even though they are not in on his plot. Of course, nothing can be expected to go according to plan, especially in a caper film. Leila is afraid of the violence and hides the gun to be smuggled onto the plane from Ghasem, thereby foiling his plan at the outset. But Ghasem goes ahead anyway and violently jumps the onboard security officer, brutally beating him half to death and stealing his gun. 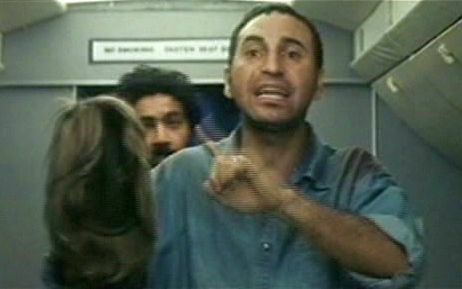 The passengers are terrified by the vicious assault and watch in horror as Ghasem tells them, at gunpoint, that he is hijacking the plane to Dubai. Hoping to quell their resistance, Ghasem explains to them that his plan is to escape from Iran to a better life in a country free from drug-addiction, dusty poverty, and corruption, and he says anyone else can join him. Ghasem was only trying to calm them down, and even he is shocked to learn that most of the passengers almost immediately appear ready to sign on with him and be partners to the caper. This is perhaps a biting social comment about despair in Iran, perhaps especially relating to the Abadan area, which suffered so much devastation during the Iran-Iraq war of the 1980s. A further revelation of the passengers' eagerness to get away from the oppressive conditions in their home country is demonstrated when one female passenger removes her head covering in preparation for her new life abroad. Ghasem admonishes her and tells her to remember that she is, after all, a Muslim and must continue to behave like one. But it turns out that the woman’s supposedly bared head was actually covered by a blonde wig – this is presumably a further sardonic gesture by the filmmakers to steer their way around, and ultimately comment on, the restrictive gender-based censorship in Iranian films and society as a whole. Of course, most of the passengers in the plane are from Ghasem’s and Narges’s extended family. In fact many of the able-bodied male passengers, who might be presumed to be capable of taking some action, are brothers of Narges. But these brothers all appear to be somewhat dimwitted buffoons, whose clownish presence goes well beyond mere comic relief. This is the major problem with the film, and they turn the film into something of a farce. As I said, nothing is expected to proceed simply in a story like this. There are violent shifts in dominance, as Ghasem loses control to the beaten-up security guard, who immediately orders the pilots to leave Dubai, where they are about to land, and head back to Bandar-Abas. A rather mysterious and opportunistic passenger, Ali-Reza, asserts himself and is at various times an accomplice of both Ghasem and the security guard. 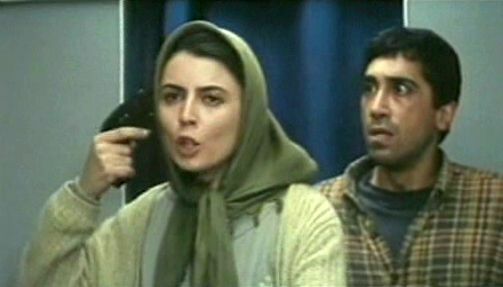 Then Narges, customarily nonviolent but loyal to her husband, grabs a gun and engages in a shootout to reassert control of the plane for Ghasem. From this account you won’t be surprised to learn that much of the story seems unrealistic. The motivations of the characters are lacking. The back-and-forth swings of control are outlandish. In such circumstance it’s not even unexpected when Narges’s pregnancy comes strikingly back to the viewer’s attention later on. As a result, the film careens back and forth between gut-wrenching terror and the absurd antics of the nitwit family members onboard. It would have been more effective either to make the entire film an action-packed thriller or to make it a ridiculous joke, but the hybrid structure shown in Low Heights is a mid-level compromise that doesn’t work. Perhaps most detrimentally, though, the passengers appear to be far too relaxed and jocular for such an anxiety-filled situation. In fact many of the acting performances are downright farcical and over-the-top. Even Leila Hatami, an accomplished film actress, seems much too calm for these circumstances, with only a slightly worried expression to furrow her brow when things get out of control. Only Hamid Farokhnezhad (Ghasem) and Gohar Kheirandish (Ghasem’s stepmother) give convincing performances to keep things going. The cinematography in Low Heights, however, is quite good. Veteran director Hatamikia manages to maintain a dynamic visual continuity and flow within the confined space the aircraft interior. He also employs a creative solution to the problem of realistically depicting violent action scenes by showing distorted, slow-motion images of visual fragments – effectively evoking the kinds of images that one retains in one’s memory after a personally violent experience. This corresponds to my own recollections of violence – they play out in slow motion in my mind, with twisted, exaggerated images of particular moments extending over the mental landscape. The enigmatic ending of Low Heights shows the passengers with a perhaps absurd sense of hope, although their various dreams and assessments of their circumstances are all a jumble. But even with that vaguely hopeful closing, combined with the other comic moments in the film, the viewer is hardly likely to come out of this viewing experience with anything other than disappointment and a sense of despair.